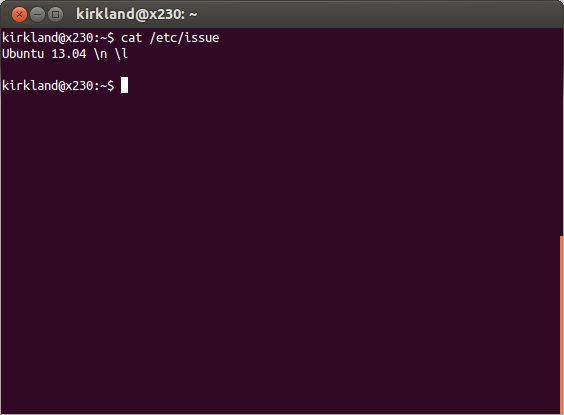 I've helped bring a touch of aubergine to the Ubuntu server before. Along those lines, it has long bothered me that Ubuntu's bash package, out of the box, creates a situation where full color command prompts are almost always disabled. You can, however, manually override this by setting color_prompt=yes at the top of your ~/.bashrc, or your administrator can set that system-wide in /etc/bash.bashrc. After which, you'll see your plain, white prompt now show two new colors, bright green and blue. "Colour is an effective, powerful and instantly recognisable medium for visual communications. To convey the brand personality and brand values, there is a sophisticated colour palette. We have introduced a palette which includes both a fresh, lively orange, and a rich, mature aubergine. 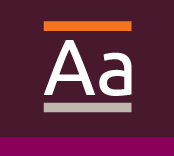 The use of aubergine indicates commercial involvement, while orange is a signal of community engagement. 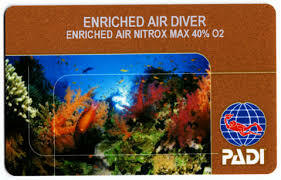 These colours are used widely in the brand communications, to convey the precise, reliable and free personality." With this inspiration, I set out to apply these rules to a beautiful, precise Ubuntu server command prompt within Byobu. 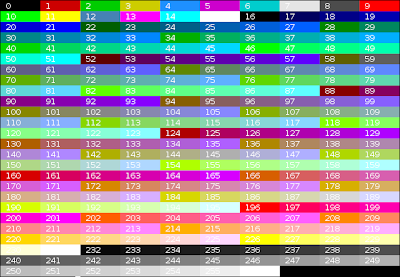 First, I needed to do a bit of research, as I would really need a 256-color palette to accomplish anything reasonable, as the 8-color and 16-color palettes are really just atrocious. 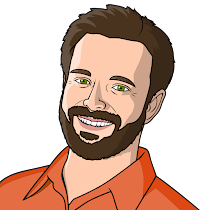 That's not quite how these colors are rendered on a modern Ubuntu system, but it's close enough to get started. 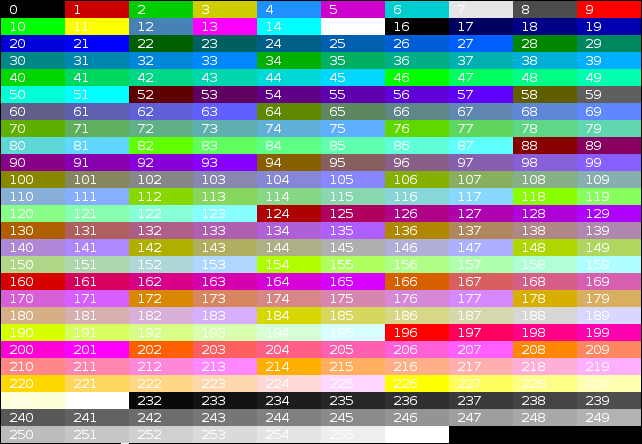 I then spent quite a bit of time trying to match Ubuntu color tints against this chart and narrowed down the color choices that would actually fit within the Ubuntu design team's color guidelines. A majority of white text, on a darker aubergine background. In fact, if you open gnome-terminal on an Ubuntu desktop, this is exactly what you're presented with. White text on a dark aubergine background. But we're missing the orange, grey, and lighter purple highlights! That number I cited above -- the 3 distinct elements of [user, host, directory] -- are quite important now, as they map exactly to our 3 supporting colors. And in the interest of being just a little more "precise", I actually replaced the trailing $ character with the UTF-8 symbol ❭. This is Unicode's U+276D character, "MEDIUM RIGHT-POINTING ANGLE BRACKET ORNAMENT". This is a very pointed, attention-grabbing character. It directs your eye straight to the flashing cursor, or the command at your fingertips. 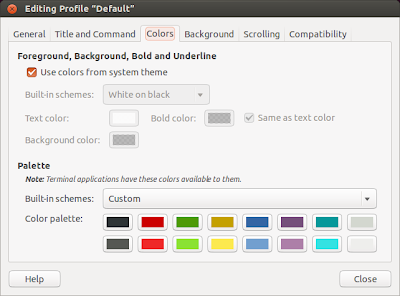 Gnome-terminal is, by default, set to use the system's default color scheme, but you can easily change that to several other settings. I often use the higher-contrast white-on-black or white-on-light-yellow color schemes when I'm in a very bright location, like outdoors. 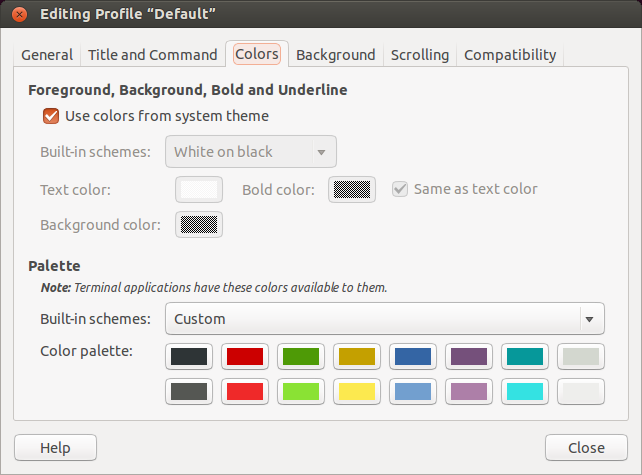 I took great care in choosing those 3 colors that they were readable across each of the stock schemes shipped by gnome-terminal. 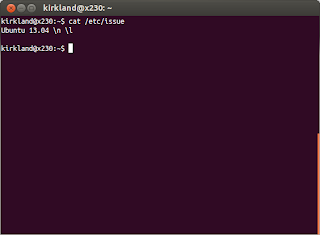 I also tested it in Terminator and Konsole, where it seemed to work well enough, while xterm and putty aren't as pretty. While new installations of Byobu (where there is no ~/.byobu directory) will automatically see the new prompt, starting in Ubuntu 13.10 (unless you've modified your $PS1 in your ~/.bashrc). But existing, upgraded Byobu users will need to run byobu-enable-prompt to add this into their environment.